BOËT STOPSON renews the Silencer at a power plant in the Canary Islands. Boët Stopson was selected to replace a silencer delivered by its Spanish subsidiary in 1989 at a power plant located in the Canary Islands. The prime purpose of this silencer is to remove dominant tones. Due to the low speed of this engine (100 rpm) associated with its power of 24 390 kW (mechanical power), it produces a high level of noise at the 15 Hz frequency. 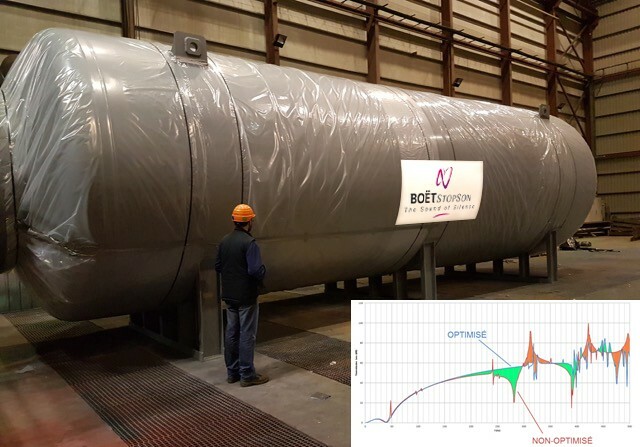 With these factors in mind, the Boët Stopson Group, through its subsidiary Sim Engineering, has designed this silencer using its modeling tools. The Group has therefore worked to optimize the design of this engine silencer in order to improve acoustic performance. The results of this modeling indicated performance far beyond expectations. This has made it possible to effectively solve the noise problem of this engine and at the same time satisfy the specific needs of its customer. In order to respond appropriately to the demands of its customers, while taking account of market developments, Boët StopSon Group has launched an innovative program to optimize its range of engine silencers. The objectives of this R&D program are to create new products, more efficient, lighter and more environmentally acceptable.